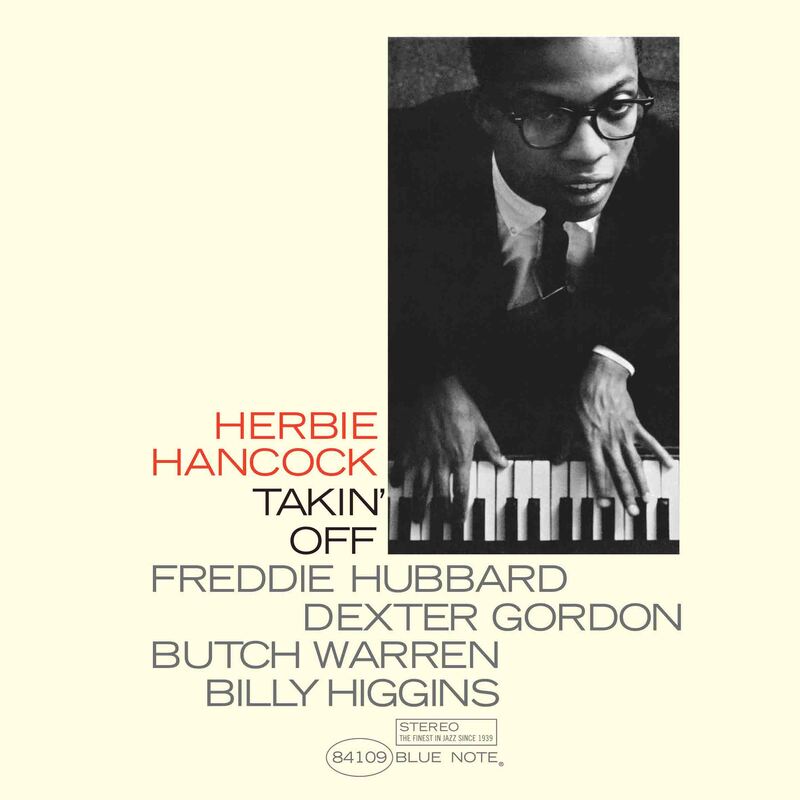 “Herbie Hancock’s debut as a leader, Takin’ Off, revealed a composer and pianist able to balance sophistication and accessibility, somewhat in the vein of Blue Note’s prototype hard bopper Horace Silver. Yet while Hancock could be just as funky and blues-rooted as Silver, their overall styles diverged in several ways: Hancock was lighter and more cerebral, a bit more adventurous in his harmonies, and more apt to break his solos out of a groove (instead of using them to create one). So even if, in retrospect, Takin’ Off is among Hancock’s most conventional albums, it shows a young stylist already strikingly mature for his age, and one who can interpret established forms with spirit and imagination. For this maiden voyage as captain of a team, Herbie did not stint himself in the selection of crew members. Freddie Hubbard, of course, is an old Blue Note friend, familiar through his work with Art Blakey and other groups, including his own. Dexter Gordon is enjoying a major renaissance since his emergence during the past year via the Manhattan jazz clubs and his own Blue Note LPs. With the first-rate rhythmic support of Billy Higgins (who impressed me a couple of years ago with the Joe Castro–Teddy Edwards Quartet in Hollywood) and Butch Warren, Herbie was assured of “takin’ off” in style. “Watermelon Man” (remember the 1938 Ellington record by that name? No connection) is a strongly gospel-infused 16-bar theme. Herbie establishes the mood immediately with his opening vamp: quarter note rest, two eighths, followed by eighth and dotted quarter-rhythmically a typical gospel figure-after which the horns state the theme, mainly in unison. Freddie’s solo stays firmly in the mood of the piece: despite the occasional unpredictable excursions into sixteenth notes, the overall feeling is basic and earthy. After Dexter has successfully plowed another part of the same field, Herbie takes over for a solo in which, interestingly, one hears the echo of sounds that were a part of the Blue Note scene around the time of his birth-men like Albert Ammons and Meade Lux Lewis. “Three Bags Full” was so named because says Herbie, “Each of the three soloists plays out of a different bag. Also this is a line from Baa Baa Black Sheep, which makes you think of a shepherd, and in a way the tune does have something of the sound of a shepherd maybe way off in Baghdad or somewhere.” The tune, a waltz, suggests something of the mood of Miles’ group with Coltrane in the late 1950’s, with Dexter’s long flat tones (flat in terms of vibrato, not intonation) evocative of the earlier Trane. Herbie’s solo here is beautifully executed in right hand single note lines, later easing into a chorded passage, with a left hand that is supplementary and never perfunctory. “Empty Pockets” (“I was in a sad financial state when I wrote this”) is a moderato blues with long pickup phrases leading to an eighth and quarter note. Herbie returns here to the simple, funky groove of Watermelon Man, but this time with a straight blues rather than a gospel feel. “Driftin'” as Herbie observes, has something of a loping quality in the whole performance. A 32-bar theme, it is stated by the ensemble except for the second eight, on which Herbie takes over. If Freddie’s sound is softer and less brash on this track, there is a reason: he is playing fluegelhorn. Herbie stretches out for two choruses, again blending ideas and execution skillfully; notice especially the run at bar 14 of his first chorus, and the increased blues-consciousness of the second chorus. “Alone and I” is a ballad, in A. “I am very much interested in chord color in music,” says Herbie, “and this tune displays much of what I have been working on in that vein.” Dexter’s pretty mood is well served by the attractive melody. Herbie rightly considers that this is the most interesting tune on the album and that it includes his best solo. In an interview with Dan Strongin for Jazz & Pop, Herbie said, “You know, there’s a good story to “Watermelon Man.’ I was working with Mongo Santamaria then (early 1962), and Donald Byrd… came down to the club. Between sets, Mongo, Don and I started talking about Afro-Cuban music and jazz. We all felt there must be similarities – traceable similarities – between the two, but we couldn’t pin them down. Mongo said he had been looking for some time for the link. Then Don said, “Hey Herbie, play “Watermelon Man” for Mongo. I had been writing the tune at the time, but it wasn’t quite right yet. I didn’t see what Don was getting at, but I played it, and Mongo jumped up saying, ‘Keep playing! Keep playing’, and he started playing and the tune fell fight into place. it was just the right setting. We had found a link. Then Mongo recorded it and it became a hit. He said it was like a tune the Cubans sang up in the mountains, a folk tune.” The Mongo Santamaria version became a crossover hit (on Battle Records) and afforded Herbie a little financial breathing room. Donald Byrd had insisted that Herbie form his own publishing company, Hancock Music, and Herbie has maintained this company to this day. In the eighties, Blue Note Records released three alternate takes from the Takin’ Off session, first in Japan and then in the U.S. (CDP-37643). “Watermelon Man” is taken a little faster than the master take, and Freddie’s solo is a little conservative. Dexter funks it up, ever consistent. On the top of his second chorus, he creates his own hip melody over the form. Herbie’s solo is pure soul. “Three Bags Full,” as with most Blue Note alternate takes, demonstrates the sometimes minor things that will determine which performance passes on to master-take status. This performance is certainly wonderful, with Dexter and Herbie playing joyous solos. “Empty Pockets” (which has the imprint of Donald Byrd’s voicings on “Jorgie’s”) is a blues. This take is as good as the master. The chord Herbie plays on the cover photograph is a C 6/9. Takin’ Off took off, and established Herbie Hancock as a pianist and composer to take notice of. Sales of both Mongo’s and Herbie’s versions of “Watermelon Man” were brisk. With his publishing money in hand, Herbie was looking for a way to celebrate his success. He purchased a Shelby Cobra, a consumer version of a high-performance automobile. Donald Byrd had a Shelby Cobra, and Herbie admired it. “Herbie was an engineer in college,” Byrd told me. “He was into tinkering with anything that was mechanical. One night, I was leaving the apartment we were sharing in the Bronx, and Herbie was at the kitchen table with my watch spread out over the top. It was in tiny little pieces, totally taken apart. When I came home later, the watch was re-assembled and ran perfectly. Herbie would open up the inside of a can opener just to see how it worked.” So Herbie bought an engineer’s car, a complex high-performance machine to tinker with. He is still the proud owner of that Shelby Cobra, and titled his composition “King Cobra” in honor of this automobile. On August 3, 1962, Herbie participated in a rejected Stanley Turrentine session for Blue Note. It was his first session with both Stanley and Kenny Burrell. During this time, Herbie was introduced to Eric Dolphy, and the two became friends. Herbie began gigging around with Eric, and on October 7, 1962, at the Gaslight Inn in New York, a private verité recording was made of a gig with Eric and Herbie and released on LP as Eric Dolphy Quintet USA in the 70s on three different labels. The performance indicates Herbie has moved forward as a constructor of musical phrases, and is searching for a sense of freedom in his lines. Eric’s influence is also there. Herbie is unbridled and loose. Three days later, on October 10, 1962, Blue Note recorded Freddie Hubbard in a quintet context. Herbie was the pianist. The album Hub-Tones shows Herbie connecting with Freddie (especially on “For Spee’s Sake”), and Alfred Lion’s feeling about this young pianist must have gotten stronger. Herbie then hooked up with Grant Green, Blue Note’s premier jazz guitarist, and they made two sessions together. The first session, recorded on November 30, 1962, was a concept album with the theme being songs of the old west, probably inspired by Ray Charles. Goin’ West (BN-4310) was not released until July of 1969, because the next collaboration between Grant and Herbie came less than a month later, On December 21, 1962. Blue Note must have been on a religious kick, because Herbie’s next session (January 12, 1963) was for Donald Byrd’s A New Perspective (BN4124). Duke Pearson’s “Cristo Redentor” became a hit for Donald, and the album was a best seller for the company for years to come. Herbie first worked with Hank Mobley on this session. On March 7, 1963, Herbie appeared on Hank Mobley’s The Turnaround (BN-4186)/ No Room For Squares (BN-4149) session, with Byrd, Butch Warren and “Philly Joe” Jones. Four days later, on March 11, 1963, Herbie and Donald Byrd guested on Jimmy Heath’s Swamp Seed album (Riverside RLP-465). Herbie had done a few gigs with Jimmy and Percy. On the track “Just In Time.” Herbie’s telepathic comping for Byrd and Heath is beautiful. The feel Herbie generates, the bouncing, joyous energy, really shines on this track. Never one to rest, Herbie was back in the studio eight days later for his second Blue Note album. This album marked roughly the midpoint of Herbie Hancock’s relatively brief and unquestionably successful period as a dues-paying young jazz musician in New York. He had arrived the previous spring after having been discovered in Chicago by Donald Byrd, and spent much of his first year rooming with the trumpeter, working and recording with the Byrd/Pepper Adams Quintet and other Byrd units, and taking odd gigs with other co-leader bands, including Al Grey/Billy Mitchel and Phil Woods/Gene Quill. Prior to this debut as a leader, Hancock had participated in five studio sessions, all but one of which involved Byrd, who had advised the budding composer to create his own publishing company and suggested strategies when the time came to approach Blue Note for his own date. As recounted by producer Bob Belden in the notes to The Complete Blue Note Sixties Sessions, Byrd had counseled Hancock to present producer Alfred Lion with a program where half of the material displayed popular potential. One of the originals presented in the ensuing audition was “Watermelon Man.” Hancock had struggled with the piece until a night earlier in 1962 when he was working With Mongo Santamaria and, at Byrd’s suggestion, played the work-in-progress for the great conguero. Lion immediately heard the potential in the modified blues and the other Hancock originals, and urged the pianist to complete the program With more of his own music instead of standards. There is no question but that Santamaria’s own more commercially successful version of “Watermelon Man,” recorded for the Riverside subsidiary Battle without Hancock at year’s end, gave a boost to the composer’s own debut effort; but listeners who checked out Takin’ Off for “Watermelon Man” found five other gems as well. They also found a pickup group as talented as any in Blue Note’s history. The Hancock/Butch Warren/Billy Higgins rhythm section had proven its inspired mettle on two Donald Byrd albums, Royal Flush (Hancock’s first issued Blue Note appearance) and Free Form. This would be the unit’s final “pure” appearance on record, as Grant Green’s Feelin’ the Spirit from later in ’62 finds them joined by Garvin Masseaux on tambourine. Freddie Hubbard, the sideman here who would enjoy the most extended working relationship with Hancock over the succeeding decades on numerous recording sessions and in the V.S.O.P. quintet, was a bit older than the pianist and had experienced a similar apprentice period slightly earlier. At this point, Hubbard was approaching his first anniversary as an Art Blakey Jazz Messenger, had issued four of his own Blue Note albums, and in six weeks would cut his first for Impulse! Dexter Gordon, in the midst of one of his many comebacks, had hooked up with Blue Note on a visit from his native California a year earlier, and was in the midst of a second extended East Coast stay that preceded his expatriation to Europe. Gordon participated in seven recordings during this trip, and his exceptional playing here was only matched by his Go!/A Swingin’ Affair twin peaks three months later. Hancock, who has frequently credited Gordon for making his debut truly special, would reunite with the Long Tall One most famously in the 1985 film Round Midnight, which also featured Hubbard and Higgins. The program represented Hancock quite accurately as one of the most versatile new voices in jazz, a player and writer capable of swinging hard stretching convention, moments of quiet personal introspection, and an undeniable common touch. Byrd had advised that his first album include “three for the company and three for you,” a balance of the accessible and challenging that Hancock has in effect maintained throughout his career. “Empty Pockets,” “Watermelon Man,” and “Driftin'” are the populist titles, and the first two are heard in alternate takes, as is the turbulent waltz “Three Bags Full.” While none of the alternates is superior to the master takes, all have strong solos and were clearly worthy of release when the album was reissued on compact disc in the 1980s. It is too bad that the challenging “The Maze” and “Alone and I” did not also yield additional versions worthy of release. Originally recorded on May 28, 1962 at the Van Gelder Studio, Englewood Cliffs, New Jersey. Tracks #1-6 originally issued in 1962 on Blue Note BST 84109. Tracks #7-9 originally issued on the 1996 CD edition of this album.